76x50 cm deep edge canvas. This painting is about the beautiful colours of Autumn which nature has bestowed on us. 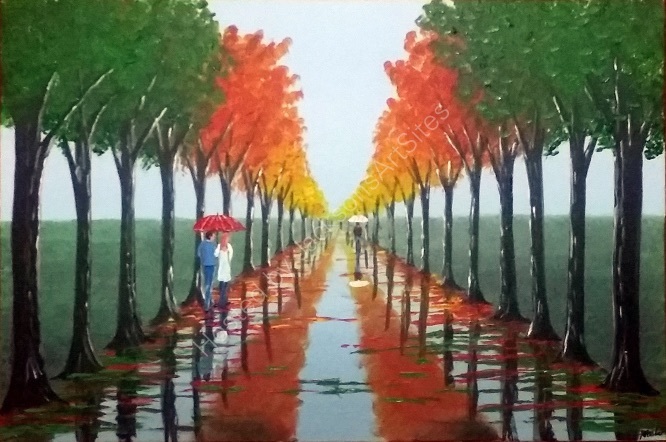 A couple of people enjoy the walk through the autumn trees on a wet day. The Autumn trees cast their reflections on the wet ground making it delightful to view. This artwork has been varnished with gloss and the painting carries on over the sides so it may be hung without a frame if desired. The artwork has also been strung at the back and ready to be hung onto the wall, The artwork is signed at the bottom corner by the artist and will be carefully packed into a custom made box and sent by a courier with a tracking number, Delivery will be made within two working days. Also comes with a certificate of authenticity.